In order to hear God’s voice and to feel His presence, we need to enter into a state of profound silence especially when we pray. Last Sunday I arrived about 25 minutes before Mass began. I was hoping to pray the Office of Readings and prepare to participate in the Eucharist. Since I got there early I was hopeful that I would encounter holy silence. No such luck. Several people were sitting in the pews and talking. Quite loudly. “Quiet—Respect Please.” It wasn’t necessary. Silence fell naturally as we stood before the statue of the man responsible for the unity that makes it possible for us to serve all 50 states. 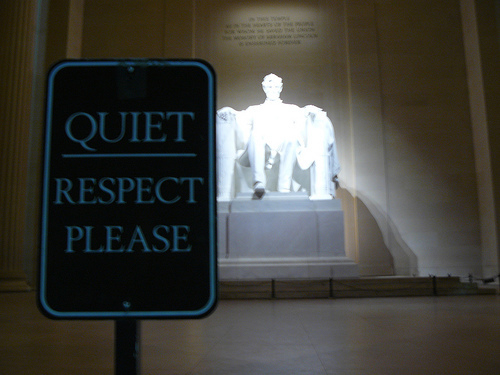 “Silence fell naturally.” The author assumed that most people would stand before the statue of Lincoln in reverence. Certainly, Lincoln was a great president. A great man. But he is still a creature. He is not the Creator of the cosmos. Yet when we come into the very presence of the Word, Jesus Christ, the true temple, we act as if we are standing around the office water cooler. No reverence. Not even respect. Confession: I am ashamed to admit that I have been as guilty as the next “mature” lady in the pew. But only when I am spoken to; I don’t want to offend anyone dontcha know. Our Pastor instituted a five minute moment of silence before Mass begins which is announced by the lector. Even the musicians are to be silent. But last Sunday the pianist banged away through the five minutes of silence. Sigh. When my husband was in Deacon formation, we spent once a month at Conception Abby. I loved participating in Sunday Mass at their beautiful Basilica of the Immaculate Conception. The liturgy was almost perfect, the Monks chanted beautifully, and no one, not even guests or people from the town talked. Not even a whisper could be heard. There were signs at the entrance to the Church that asked that those entering maintain “Holy Silence. A sign similar to the one in the Lincoln Memorial should be in every Catholic Church. The Screwtape letters were published in 1942. Before televisions in every home, iPods, cell phones etc. I would think that the research is complete. And the results implemented. The devils can sleep in even on Sunday morning. This entry was posted in Catholic Church, Mass, Prayer and tagged C.S. Lewis, Catholic Church, Conception Abbey, Holy Silence, Lincoln Memorial, Mass. Bookmark the permalink.